The highly ambitious AN AMERICAN WEREWOLF IN PARIS contains some breakthrough computer generated character animation, in the form of the film's giant werewolves that stalk unsuspecting Americans and Parisians. While the hair rendering on the werewolf is extraordinary, there are plenty of other issues involved with its effect that make the werewolves look out of place and synthetic. Like most monster movies, a CG version was used for wide and medium shots, while closeups were handled with an animatronic werewolf used on set. Santa Barbara Studios handled all of the CG sequences, which range from very sharp and realistic to obviously composited with robotic animation. The computer generated werewolves in AN AMERICAN WEREWOLF IN PARIS were handled by Santa Barbara Studios. The above shot is one of the first full-body shots of the Sarafine wolf, highlighting SBS's terrific CG hair. The lower shot is one of the film's best CG appearances, with the Andy werewolf shaking off excess water after jumping out of a fountain. Sarafine (Julie Delpy) goes through an amazing transformation; with a few head tilts, she begins to turn into a werewolf. Utilizing digital technologies like morphing and CG animation, the transformation scene is dazzling to watch. In a single shot, her head and neck change in front of the audience's eyes into a grotesque creature. The camera cranes down to reveal her new, hairy chest, to her legs which grow massive amounts of hair, even a new joint in each of her legs that crack into place. The sequence is really cool, ending with a wide, profile shot of the final werewolf landing on her front paws. In this shot, the hair all over the being is quite visible, and realistically appears backlit, full of highlights. 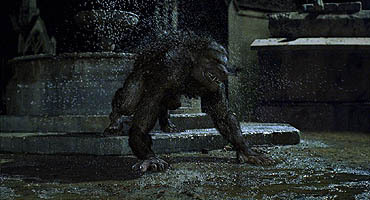 The full body werewolf shots feature this realistic hair, but what ruins the effects in many shots is the frequent robotic animation, with the creature sometimes moving quite slow and deliberate, and at other times moving faster than can be believed. More of SBS' work from the film. The above shot takes place late in the film, with the CG werewolf illuminated by the flashlight of a dead cop. The bottom shot is one of the terrific Eiffel Tower composites, with Andy and Sarafine falling hundreds of feet to the ground. There are a few terrific shots in the first rampage sequence, as a team of werewolves make their first attack at a party. A strobe light flashes blasts of light which eerily illuminates the rampage, with several werewolves jumping all over their prey. A handheld/steadicam sequence photographed in a Parisian sewer contains some very scary shots. The werewolf appears small in frame at the end of a tunnel, on its hind legs, then drops to all fours and charges toward the camera. In the kinetic sequence, which includes some interesting over the shoulder shots of the wolf, the compositing and animation of the werewolf are pretty realistic. The match moving, however, sometimes isn't accurate as the wolf's feet sometimes slide across the ground. The shot of the wolf smashing through the gate features an extremely robotic camera move, although the wolf animation is solid. In other sewer shots, the lighting and compositing is inconsistent; with the entire sewer illuminated with dull grey-blue lights, the wolf appears unnaturally brown, and really sticks out of the frame. The film's signature image is the Andy werewolf jumping out of a cemetary fountain, causing water to splash all around him. Andy falls on all fours, with water splashing around him. The real water interaction with the CG animation is choppy, with sharp matte lines clearly visible. The next shot, however, is the finest of the film. Another slo-mo shot, it depicts the wolf on all fours, shaking off excess water from its body. The shot is glorious, with streams of water realistically snapping off its wet body, flying with natural motion paths. The animation of the wolf is also very realistic, the most animal-like animation of the film. Another in-your-face shot takes place behind mausoleum doors--the doors swing open, as the wolf blasts inside and lands on its front paws. The camera tilt in the shot is pathetic--the move almost preceeds the action. This kind of predictive camera move takes the audience out of the picture, realizing that no cameraman could perfectly predict the path of the wolf, landing on its front paws, as it did. A really nice couple of shots take place in the cemetary, as the wolf is ripping apart a poor woman, while a Parisian inspector fires his gun at him. In a series of neat shots, the wolf is seen in the distance--his head bobs up, then slowly begins walking toward the camera. He runs right into the camera, with the last frame of the shot being filled by his ugly, yellow eye. The movement and lighting of these shots is really neat, and naturalistic, integrating the wolf into the cemetary surroundings. More nice wolf shots take place as the Fourth of July party gets broken up--in one fascinating shot, a policeman handcuffed to a wolf gets knocked over as the camera pans right to reveal another wolf on the rampage. One of the coolest shots of the movie takes place in yet another dark tunnel, where a malfunctioning flashlight briefly reveals a charging CG werewolf. The film ends with some neat and not so neat shots of CG werewolves. Neat: the wolf that slides down a shaft only to get hit by a train. Not so neat: a transformation shot that takes place on a subway train, where the wolf totally appears pasted in. Neat: a 15fps transformation shot, where Andy runs through the train, slowly becoming a werewolf. Not so neat: a shot of a werewolf getting hit with a policeman's bullet, sliding on the ground. 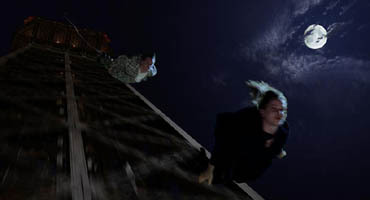 One long, non-wolf effects sequence opens the picture, with the three American buddies contemplating a bungee jump off the top of the Eiffel Tower. Dozens upon dozens of greenscreen composites, with the camera flying all over the place, are extremely believable. The opening dolly shot, that tilts down to reveal Paris at night, is extremely convincing. Backgrounds appear naturalistically out of focus, with color and black levels consistent throughout the scene. As Andy and Sarafine jump from the tower, a series of nice composites depict their fall, although some compositions (especially ones with the moon in the background, perfectly framed) are a little too nice to be true. The motion blurring and camera movement in this sequence add a great deal of realism, even though it's perfectly obvious that no camera could ever capture the action. There are a few matte paintings in the film, depicting the abandoned church where the last half of the film takes place. A daylight shot shows some human wolves pulling up in their cars, escorting Andy into the church, as the wide shot tilts up to reveal the decrepid building. The background plate was incredibly unstable--the spilt line between the real footage and the matte painting was quite obvious. The camera move was a little robotic, as well. An evening version of the same shot, minus the camera move, was a lot more convincing. A matte painting depicting the interior of the empty building, with dramatic blades of light streaming in through windows, is a delight for the eyes. A later painting, combined with a tilt down camera move, contains some realistic barrel distortion at the ends of the frame, and is a wonderful set extension. The film ends with a terrific sequence of Andy and Sarafine bungee jumping off the Statue of Liberty. Using both real aerial photography and some CG inserts of the Statue, the characters totally look like their plummet actually happened. In a few shots, the sky totally looks like a grainy, still image, and the first tilt down shot off the railing has excessive lens flare elements, and the New York skyline is much too detailed and contrasty for a shot like that. But besides these nits, the sequence, as a whole, is quite convincing, especially due to the kinetic, sometimes wild camera shake involved with nearly every shot. There are also some delightfully cheesy 2D shots in the film of ghostly images from Andy's past walking through walls, tables and buses. The CG work in AN AMERICAN WEREWOLF IN PARIS has moments of greatness, combined with moments of obviousness, while the 2D work was quite consistent and believable. The movie is an unexpected gem; a highly entertaining romp in the spirit of THE FRIGHTENERS and SCREAM with fine performances and some terrific dialogue. It's definitely worth seeing, if only for the funniest visual effects shot involving a condom since SKIN DEEP.